The City of Edmonton has received a proposal to expand the existing Orchards Neighbourhood Structure Plan by adding 110 hectares of land. This area is currently designated as Neighbourhood Four in the Ellerslie Area Structure Plan. By adding this land to the Orchards, the applicant suggests that the neighbourhood will be better connected and provide all the amenities necessary for a complete community. This area was originally identified as a separate plan area (Neighbourhood Four) in the Ellerslie Area Structure Plan. The applicant proposes to add this area into the Orchards NSP to create a more connected neighbourhood. This requires a major amendment to the Orchards at Ellerslie NSP to designate land uses and infrastructure that will connect the two areas. Once the Orchards neighbourhood is completely developed the total population will be approximately 15,400 people. How quickly the area develops depends on housing demand and other market conditions. The land uses proposed are consistent with the existing, developed area of Orchards. Geotechnical Report Determine the subsurface soil profile and suitability for underground infrastructure and house foundations in the plan area. J.R. Paine and Associates Ltd. Hydraulic Network Analysis (HNA) Provide an analysis of the water network proposed in the plan area. Stantec Consulting Ltd.
Neighbourhood Design Report (NDR) Outline the proposed sanitary sewer and storm drainage system in the plan area. Stantec Consulting Ltd.
Parkland Impact Assessment (PIA) Describe the parks and open space concept for the plan area. Stantec Consulting Ltd.
Community Knowledge Campus Needs Assessment (CKCNA) Determine the best location, size, and configuration for school sites in the plan area. 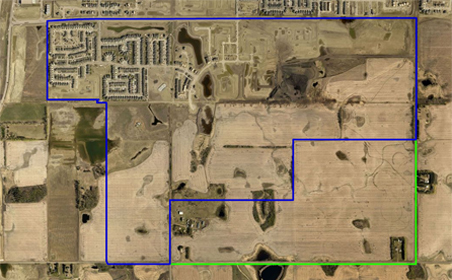 Stantec Consulting Ltd.
Environmental Overview Identify any areas of environmental concern in the plan area. Stantec Consulting Ltd.
Ecological Shadow Plan Identify ecological sites in the plan area which will need further analysis at the zoning stage. Stantec Consulting Ltd.